Antique - Sudlow's Burslem Pottery Art Deco, Ewer "Royal", from England, Circa 1920's. A Beautifully Hand Painted and Colorful Art Deco Ewer, made in England by Sudlow's Burslem Pottery in the 1920's. This Pitcher is 11 1/2" Tall with the Scene of a Woman in a Blue Billowy Dress, sitting under a large tree with Purple Flowers. She has an Orange Bonnet, and is writing on a Desk. Very Similar to Clarice Cliff and Suzie Cooper Items. Colors in the Picture are Mustard, Green, Orange, Blue, Yellow, Brown and Purple. No Cracks, Chips, or Crazing. A Beautifully Hand Painted and Colorful Art Deco Ewer, made in England by Sudlow's Burslem Pottery in the 1920's. 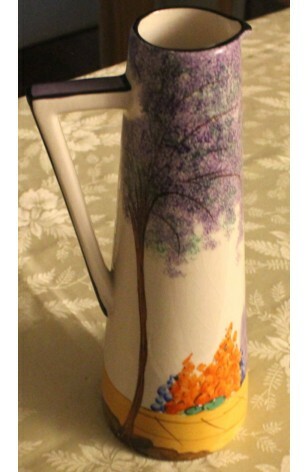 This Pitcher is 11 1/2" Tall with the Scene of a Woman in a Blue Billowy Dress, sitting under a large tree with Purple Flowers. She has an Orange Bonnet, and is writing on a Desk. Very Similar to Clarice Cliff and Suzie Cooper Items. Colors in the Picture are Mustard, Green, Orange, Blue, Yellow, Brown and Purple. No Cracks, Chips, or Crazing. Found to be in Very Good Resale Condition.